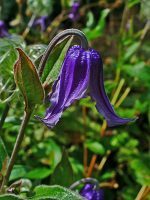 Solitary clematis is a sprawling perennial with a woody base and a member of the buttercup family, Ranunculaceae, that also includes anemone, delphinium, and columbine. Native to central and southern Europe and Asia, it has wiry stems bearing medium green 2-5.5″ long leaves that are ovate to oblong, sessile, entire, and conspicuously veined. The nodding flowers are 1/2-1″ wide and are carried singly on slender pedicels up to 8″ long from summer into fall. They are urn shaped and have cream colored anthers and four recurved indigo-violet sepals that are slightly twisted. Attractive plumose seed heads follow. 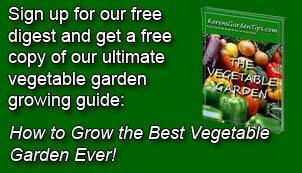 Plants should be slightly staked and the roots should be kept cool , shaded and moist. Stems die back after frost and reappear in the spring, so flowers are on new growth. The genus name, Clematis, comes from the Greek word klemetis meaning climbing plant. The specific epithet, integrifolia, comes from Latin words integer meaning undivided, and folia, meaning leaf.